I despise most forms of house work, and when it comes to doing home improvements, I really want to run and hide. So, when we recently bought our fixer-upper house, it was no surprise that we expected to hire out most of the work. This involves a lot of price shopping, comparing, and research in order to get the best quality products and services at a price we are happy with. The first thing we hired out was painting. Yes, we could have painted ourselves. But in the end, it would have taken too much time, we would have hated every moment of it, and it would have ended up looking like crap. Neither of us has a steady enough hand to paint the line around the ceiling and trim. If you’ve ever painted a room, you know what I’m talking about. Paint on the ceiling, paint on the trim, it bothers me every time I look at it! When we’re talking about something I’m going to see most of the day, I want it done right. I know that a lot of people think that painting should be the last piece of the puzzle when remodeling, and for certain rooms, I agree. We have to make cabinet and counter decisions before we can choose colors for the kitchen and bathrooms. But, for the rest of the rooms in the house, I decided to choose colors we liked and then build the room around that. I’m sure that if I had any design skills at all, I would choose the furniture and accessories for each room, and then a color for it. But since I don’t have those skills, I do it in reverse. So, how do you find the right painter for the job? I found my current painter in a round about sort of way, and we’ve been using him for about four years for various jobs at our current house, our rentals, and now at our new house. We own a rental property, and I went to a few meetings about real estate in Cleveland. Through one of those meetings, I found out that there was a website where firefighters could post other jobs & services that they could provide. Firefighters have days of down time, and they are sometimes looking for other ways to supplement their income. Everyone has firemen in their community (I hope), so it’s worth it to find out if any of them offer a service that you are looking for. We got three estimates, and our fireman came in at a much better price than the others. When you aren’t dealing with salesmen, there is no middle man to pay and you will typically get a much better deal. Dealing directly with the source is a great way that we have been able to save money. He did a great job, and he’s been our g0-to guy for painting since that initial job. When I look at the paint job in our new house, I just fall in love. 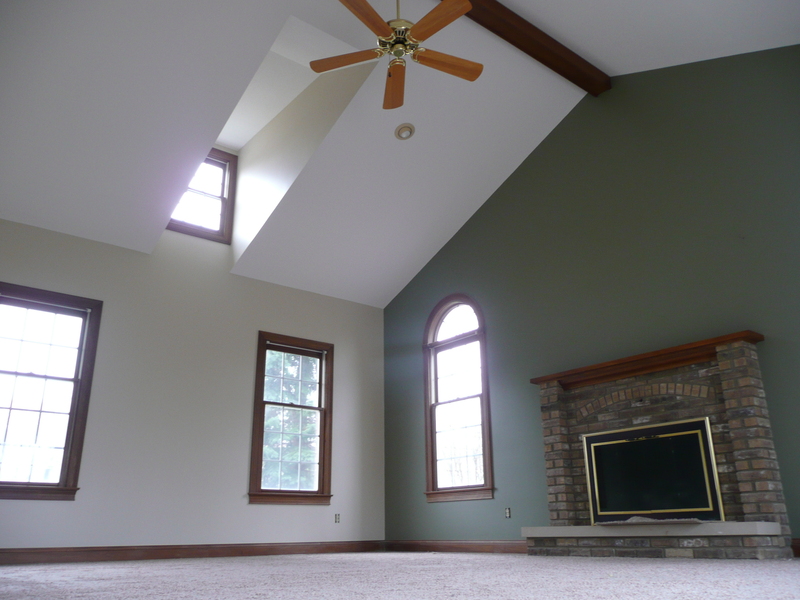 The lines are absolutely perfect, and there is no paint on the ceiling or trim. Painting is an art, and I believe that hiring a professional was money well spent. It allowed us to keep the time we would have spent painting to do something we really love. I am watching Logan all day and my husband puts in long hours for his business, so I put the cost of our free time at a premium. If you love painting and are good at it, I say go for it! Certainly that is going to save you the most money. But we aren’t good at it, and we hate doing it. If you live in the Cleveland area, and are looking for a painter, I recommend Mike Fallon Painting at 216-337-5420. Tell him Stephanie sent you! This entry was posted in Home and tagged home, home improvement, painter, painting. Bookmark the permalink. Love your logic, your appreciation for the fine art of painting your home, and that you’ve provided income for a man who is both talented & worthy of thanks every day for his “day job.” Love the photo!!! And probably, most of all, love that you know what’s valuable & do all you can to savor it.